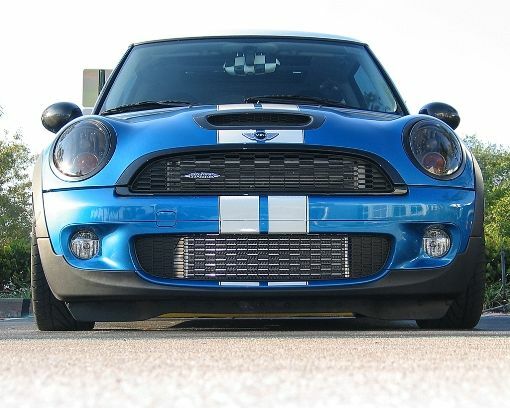 Forge Front Mount Intercooler for 2007 and newer R55 R56 R57 R58 R59 MINI Cooper S Turbo. 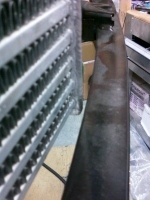 Forge developed this more efficient stepped core intercooler. As a reduction in intake air temperature increases the density of the charge mixture within the combustion cylinder any temperature reductions will equate to more power. This Forge intercooler is constructed using a combined 80/40mm high thermal efficiency core, with a 250% larger surface area and a 125% thicker base core, to achieve the best possible results. 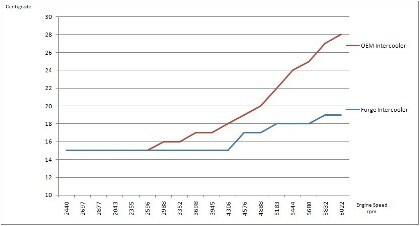 See Graph for details of temperature reduction. In fact even in relatively low road speeds / air velocities our intercooler was able to better the OEM unit by nine degrees centigrade, with greater improvements being achievable during greater speeds during track testing. 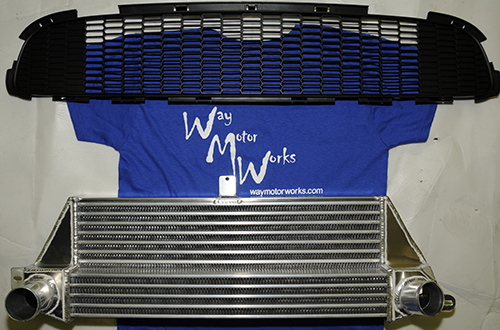 The replacement intercooler is supplied with all the mountings to allow ease of installation. Please note that this kit has been designed to fit behind the original Cooper S front panel. If an alternative aftermarket front panel has been installed, where clearances are reduced, additional trimming may be required. Forge Intercooler weights 8lbs 7oz total. 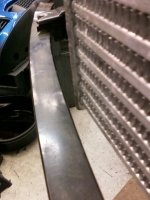 Intercooler has 3 mounting tabs to install it. 2 of them mount to the stock MINI intercooler locations, the 3rd is an additional one to mount to the bumper support if you want additional support. On 2009 and newer models this 3rd tab is not used. Definately the best thing for consistant power throughout the entire power band! A must for track day driven cars, was definately impressed with the quality of the product and the included new grill makes install a breeze!! Compare to the stock unit and even without feeling all the performance benefits you know your engine is running cooler and more efficently.On the track or in the summer it should perform with more and more benefit. This thing just shines in hot summer weather! I purchased this for my 2012 Coupe S and there was no need to shave anythng. It was a straight swap with OEM. It weighs less and bolts right on unlike other FMIC's on the market. No need to use the top tab, its not going anywhere with the two tabs already being used. AND it's competitively priced! Just installed on my Factory JCW. HUGE difference. I probably notice more improvement than most due to living in the TX heat, but this part will benefit anyone's turbo Mini. Don't expect crazy power from this mod, but expect to see a much happier engine when it's hot. If it gets more than 70 degrees where you live, then you need this part! Best mod I've done so far.